After a few weeks of rounding up materials and getting to know the UPS guy, we turned the pile of clear yellow pine into frames. We found that there was more slope in the floor of the shed than we thought when we leveled the stongback. 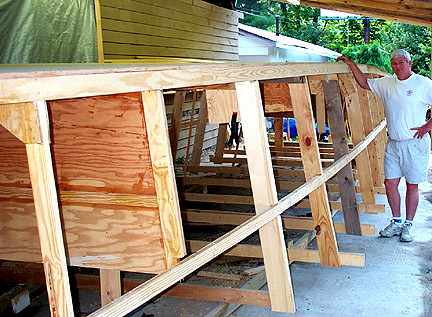 The shed was a good size for boatbuilding when we started but got really small as we set up the frames on the strongback. This is a big boat!! Our first epoxy session was on one of the permenent frames and it wasn't pretty. Epoxy tip: Use a roller instead of a brush and you end up with a smooth surface and no runs. After sanding out all the runs on the first frame we got really good, really quick, at scraping up any excess epoxy that doesn't stay in the joints. After the frames went up we just had to put on a tempoary chine and sheer clamp to see if the fames were fair and to see the lines of the boat we had just worked days to build. Only got one wrong and we will remake it this weekend. 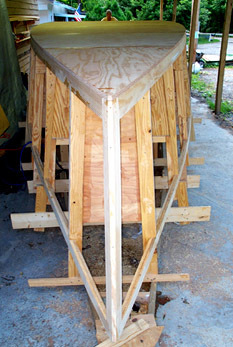 Next we will bevel the frames for the plywood, add the inner stem and finish the transom, then it's on to plywood. We have been busy getting the chine logs on. It seems we made a mistake on a frame measurement and had to do a little extra work. 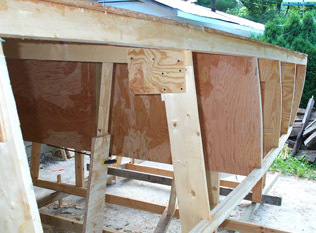 Finished making the transom last weekend and cut notches for shear clamp and the other chine log. We will spend this weekend getting our business ready for transport to it's new owners home. This will make room in the shop for my workbench and tools again. Next week it's off to the Gulf coast to do some much needed fishing for a few days so I don't think we will get much done untill I get back. 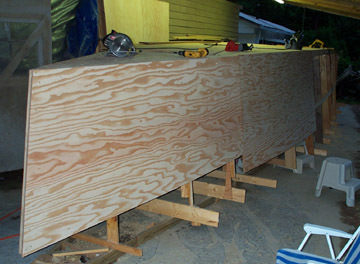 I will try to get some new photos showing the transom posted before I leave. The fishing trip was great! I worked on the chine logs some last night and hope to get the sheer clamps on this weekend. I have more room in the shop now that the business is gone. We are chartering a 41' canal boat on the Erie Canal next month, a birthday present for my wife, and we hope to get some ideas for our boat. They use the same systems as we will on our boat. We did the same trip 2 years ago and loved it. The best "boat" vacation we have had. We will do the Erie Canal from the Hudson to Lake Erie as part of our "Great Circle Route" some day after we get this boat done. Ordered 30 gallons of epoxy and 125 yards of xynole cloth to round out the materials needed to finish the hull. Fiberglass Coatings in Florida is a great company to work with and they have all the epoxy you will need at great prices. The next trick is to find the time to get some serious hours in on the hull. We still hope to be in the water by late summer 2003. Good progress made this weekend. We finished the port side and lack 2 sheets on the other. 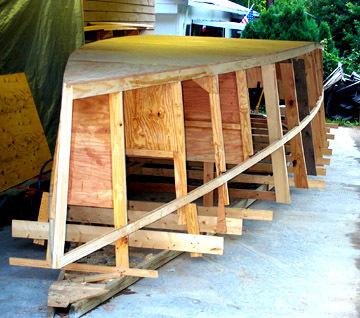 The photos show the progression and the tumblehome on the stern. It took a few minutes to figure out how to get the curve without breaking the plywood. We are using 3/4 marine ply and it protested when we tried to get the curve on the stern but we got it worked out with a little more planing. It's starting to look like a boat now. You get a sense of size with the hull closed in. Frames with first layer of plywood on bottom. Tumblehome! This is one tough bend for plywood. This one shows the stem and the first layer of bottom ply.